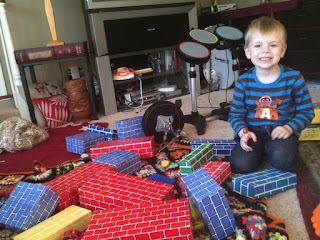 This is how Parker and I have spent our afternoon today. 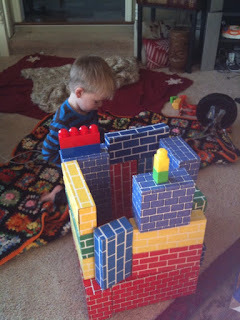 Building houses and towers out of bricks, over and over. Every once in a while he'll belt out a festive song and dance (school Christmas show I presume) and occasionally his tower will, in fact, be a mystical creature of some sort...like a bad guy tree (a tree with bad guys hiding inside, Jeez!). It's been quite nice actually as I've had a chance to write in between brick laying and even managed a mug of hot chocolate. Monty and Elliot are sound asleep and Parker is getting all the LOVE.